In the quiet pedestrian lane, named after the hotel, you find Rambutan Hotel & Resort – Siem Reap, two little oasis’s located next to each other at the east side of the Siem Reap River. The Rambutan Hotel & Resort are just 5 minutes away from the old market, in the historical town center of Siem Reap. 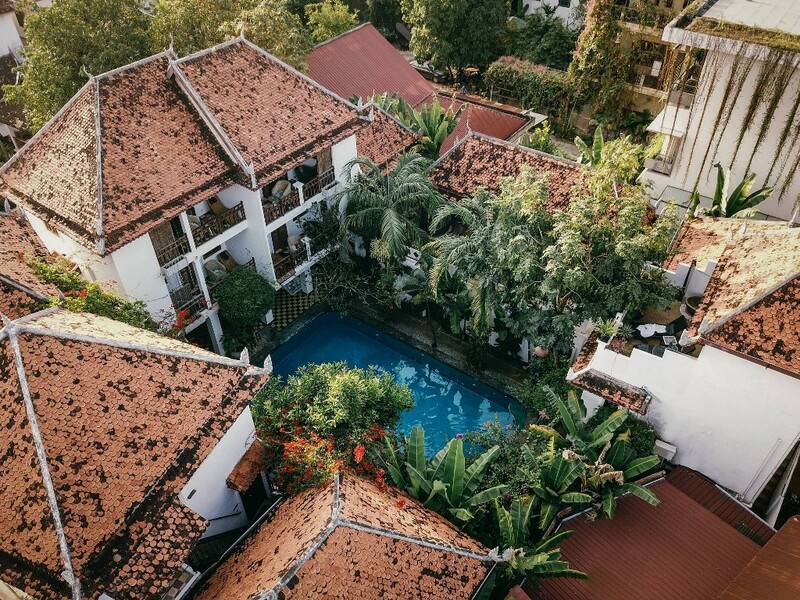 Both properties are built as small traditional Khmer villages have and have an own lush tropical garden, complete with a saltwater pool. The Hotel & Resort have their our own restaurant, bar, and spa. The main focus of the accommodation is comfort and privacy. The Deluxe Terrace and Deluxe Rooftop Terrace rooms located at the Rambutan Resort. These rooms have their own private terrace, featuring an outdoor bathtub and a splash shower. The Balcony Villas at the Hotel wing are split over two levels offering a lot of space where guests can relax; both for living and sleeping. A stylish design coupled with some local culture, ranging from the contemporary artwork to the locally-made furniture and silk textiles which are in abundance. Both Rambutan Hotel & Resort are hip, happening and gay-friendly, and run a social and eco-responsible business. Special discount on food and beverages. Expats living in Cambodia save 15% and Cambodian nationals get 30% off. Enjoy cocktails for $3.5 instead of $5 during the daily happy hours from 5pm - 7pm at R-Bar and Restaurant. The pool is delightful and the cocktails are absolutely the best. The bartenders take great pride in making excellent drinks and some of the combinations are the most creative and delicious to be found anywhere! And they are always served with an amazing smile. If you are looking for a really pleasant stay in Siem Reap, I highly recommend Rambutan Hotel and Resort.